Looking for an 80% increase in conversions? We've been beating the drum for the value of augmented reality for a while now, and last week a white paper was released that provided a wealth of strong initial data to support our claims. Among many useful nuggets of info, two stand out -- Modiface CEO Parham Aarabi's assertion that there is an 80 percent increase in conversions for consumers who use the makeover technology; and the fact that AR campaigns have an average dwell time of 75 seconds— 2.5 times the average of radio or TV ads. With the wider release of WebAR coming ever closer, now is the time for brands and agencies to start thinking about and prototyping campaigns. We recently expanded our offering to include AR prototyping services, and would love to start working on some sketches to show off the power of augmented reality. 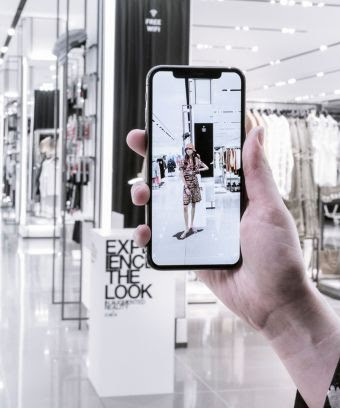 Fast fashion retailer Zara recently released an AR app that hints at what retailers could do with the technology. The current app is fairly limited -- a user downloads it and points it at an empty store window, and sees models come to life for a few seconds. As is stands, there is no customization, but that could easily be the future. Imagine every person getting a custom window display based on their personal tastes, and even mannequins to match their specific body type, so you could see if something looked flattering on you as opposed to stick figure. It's great to see more retailers experimenting in the space, and hopefully points to more innovation soon. First off, massive thanks to those of you who braved the rain to come to our panel at the NYC Media Center! We had a packed room and interest was so high that we got booted out of the space because we went so late. We are now working on setting up meetings during Tribeca, so if you're in town, please let us know. We'll also be speaking June 1 at Augmented World Expo if you're on the west coast. Older PostIs there a YouTube tutorial for something now? Then there should be an AR tutorial in the next year.